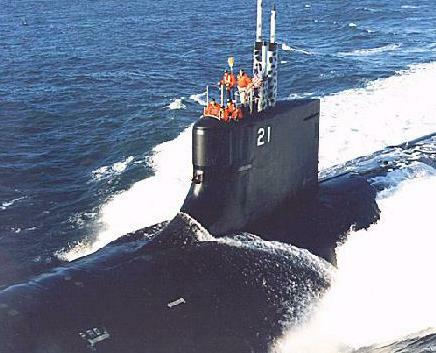 **This submarine page contains over 600 links to other submarine sites and information on the Internet, and for that reason you really need to save a couple of days to explore this site. It is also heavy in graphics and may seem slow to load. There are links to pages written by members of boats crews, official Navy sites, sites for Vets, research book links, photos of boats, foreign sub sites, an area for collectors, R&R, information on ports/yards and material of historical importance. Areas are set up with nuclear information, weapons, link pages to other naval sites, a submarine BBS for asking questions or leaving mail and a "misc" area to cover everything else. Enjoy and I hope you can use the material I have located or maybe it will just be "good old days" cruise. I am a believer in content rather than beauty, and that's why the page doesn't have a fancy background of a surfacing sub or something similar. All the fancy graphics, backgrounds and large pictures take time to load and if you are using a 14400 modem or slower then the wait is huge. The page won't win any awards from the "award givers,' but that's fine with me if you find the page useful. By the time you have read this, hopefully the graphics will have loaded and you won't get frustrated at the wait. Are you ready? All Ahead Full! Naval Command Insignia Site This Insignia page co-authored by Lt. Bryan Lethcoe (Rice U NROTC) who does the page work and myself, who searches the web daily for more. We are in need of your naval insignia of any unit (shore/air/surface/subs). But it must be in file format. Do not send actual patches or decals, etc. A scanner is not available. Thanks. Gif animation done by Bill Johnson. See his page at www.inetnow.net/~dollarbill. This page is home ported on WAVE COMMUNICATIONS Server, which is Northern Wyoming's premier Internet service, and was created with HTML Pro 2.0 and Netscape Gold 2.02 as the browser of choice. Wall of Honor at SubBase, Groton. This picture is one reason this page exists. I think they would appreciate it and we need to help perpetuate their contributions and memory.
" I wish the United States government would break its reversing gear, so that it could only go ahead. It does go backwards many times." Appropriation speech in the US House of Representatives in 1904 concerning the fight to purchase 5 more of Simon Lakes submarines. Thanks for stopping by my base. This page will indicate what I did for 8 years USS CATFISH SS-339 (61-62) and USS PATRICK HENRY SSBN-599 (63-68) back in the 60's. I am currently living and working in Sheridan, a beautiful little town of 15,000 in the foothills of the Big Horn Mountains, Wyoming. On a map we are located on a bearing of 270 and range of 250 miles from the Black Hills and Mount Rushmore or on a bearing of 090 and range of 200 miles from Yellowstone Park. IF YOU KNOW OF OTHER SUBMARINE SITES OR GRAPHICS, please fire the address to me at . Or if any of the links are duds, let me know which ones. pings on my page this year. Thanks to all visitors! This area >>> SUBMARINE BBS<<< is your area to leave messages, search for information or shipmates, seek reunion information, ask questions or whatever you want as long as it is submarine oriented and is not offensive to anyone/group. Sysop Ron Martini. Afloat Report>>> 410135 (down 1920 in the past 2 weeks) active duty Navy. There are 40 (of 80)(I would like to know where the other 4 came from that weren't in this listing 2 weeks ago) SSNs or SSBNs at sea as of 10-15-96. Guest Log: Please sign in AFTERafter viewing the page. Thanks folks. Are you looking for additional submarine information? I can help. I have been collecting information on submarine books for 9 months. I have the only submarine bibliography on the Net. I will send you this listing of some 1400 submarine books listed by title, author, publisher, date, pages, ISBN# and other information for $5 minimum (going to $10 Jan 1!) or whatever you deem appropriate. Sound greedy? Read on. I will, upon receipt of your $5 minimum (check is ok) and an E-MAIL ADDRESS, send you the file in .zip format and a program (List) to view, scan, search the bibliography. This is tax deductible to you! I will send all $$$ received to CAUSS to use for the very worthwhile CAUSS/HED Foundation charity, which buys medical "cool-suits" for children in memory of lost submariners. For more information on HED click HED FOUNDATION . If you need additional information on CAUSS please visit SUBNET. What's in it for me? Just the knowledge that I may have helped a fellow submariner who is looking for information and also knowing that I have helped a very needy child. If you want the bibliography contact me by mail with your check made payable to HED Foundation c/o Ron Martini-1723 Desmet-Sheridan, Wy, 82801. (DON'T FORGET YOUR E-MAIL ADDRESS) or send $7 if you want a disk instead). THANK-YOU and they will also. Ping on SubNet. The National Submariner Directory is a good source for locating shipmates provided they are listed. Please list yourself in the directory first so that others can find you in the future, then proceed with your search. There are some 27,000 names on file! The directory is continually looking for ships rosters, crew lists, and other names of submariners. After registering yourself here then ask about your shipmate. Another possibility, if you know the persons name and area of the country, is to search through a great new on-line phone book Infospace Worldwide Directory. Reunion Info Page is located at Ship Reunion Page. In recognition of the efforts Web authors put into their work, time spent searching for new sites, and all the endearing e-mail they receive; if your page is selected as a "SURPRISE LINK" on this page you may so state on your page and you may also display . Should your page grow and be chosen again in the future you may display two of the logo graphics on your page. Past pages that have been linked as the "Surprise" are also eligible. ****ATTENTION**** The best submarine site on the Net is Pampanito!! Awesome! My Sub Pick/Super Surprise Link of the Year. Check it out and send them e-mail. This page is the ultimate, especially for the diesel guys!!! Two years in the making! Great Start! The Best Ride in the Navy! Want to get rid of the anchors that are weighing you down? Check this site! Surprise Links >>Added two new Surprise Links. Contest >> Winner announced. New contest underway! No guesses in a week? Clue East Coast. R&R >>Added 3 sites that have additional reviews of the move "Down Periscope", and another page that has sound clips from the movie. Main Page >> Updated Navy status. Where did we gain 4 new boats in 2 weeks? ComSubForeign >>Changed an address on the Swedish submarine text file page and also upgraded the English Navy Homepage address. Logs >>Added a page called American Memories Archive. This is searchable (submarines for example) but grossly slow to display large files or graphics. Some neat stuff here that really goes back in history. It was where I got the quote above about the government going in reverse in regards a submarine appropriations bill some 90+ years ago. Books >> Added several sites. A page that takes you to US Gov locations where you can obtain publications on Naval History, Nuclear Power, Naval Training and Veterans Affairs. Want to know how your Vitamin D count does while on patrol? It is here. Added another Page that sells Military and Naval History Books (new & used). Not submarine related but great history reading is a book on line with 10 chapters on the battle from WWII on Battle of Leyte Gulf. Periscope >> Added a nice (if not a little mystical) picture of the SSN21. Scuttlebut >>Added some dates of boat decomms, etc. Also added some info on SSN22 and SSN23. Better than never is the sabotage to the San Juan last June. Navy Football score update. We are 4-1. They were off 10-19. Army is 6-0 however. Navy plays Notre Dame on 11-8 in Dublin, Ireland. Click on the below pages to find over 500 links to other great submarine sites and sources of submarine information. .....Links to other submariners home pages. Has one of your shipmates written a page? .....Stories and links from the past, museum information and other historical information. .....Navy News and links to mostly official Navy sites. .....Many veteran, dependent, associations and retiree places to visit. .....Links to links to links. .....Occasional contests are put here. New contest 10-09-96 .You just might see your name on a WWW page. Jerome Maxwell of Tarpon Springs, Florida correctly identified the picture as the Cocos Island off the coast of Guam. You WestPac types should have gotten that. This page has no commercial intent and any financial gain from its contents are not and will not be accepted. This page has no official standing with any branch of the US Government including the US Navy. Some of the links may direct you to "Official" Navy or Government computers and you should read the warnings posted before using. All material on this page is available to the public via diligent and thorough websearch. If there are any copyright violations, please notify me and the material will be removed. Also, the inclusion of any site or material on this page does not necessarily indicate an endorsement by me of the contents. All I want are more links to other sites containing submarine related articles/pictures/information. Also do not hesitate to e-mail me with corrections or links that may have become duds, hot runs or have reached the end of their wire. Thanks also to Don Merrigan of SubNet for his support and assistance on many matters. Thanks to Jack Kendrick of Wave Communications for making this all possible, and to Ray Kopczynski for lots of HTML, graphics, and title work. Ray has opened a Computer Renaissance store in Corvallis, Or. Great Link site at Hogan's Alley. Navy ___ ND ___ *This game to be played in Dublin, Ireland 11-8.